In the early nineteen hundreds, makers of lantern globes started manufacturing a standard globe size of 5 3/8". Although they were generally made for railroad lanterns, the globes fit many other types of lanterns. Some had an oval or pear shape to them. Deck lantern also used the ribbed globe, it was not functionally required because it doesn't have a shield. Use of the same globe style was probably due the lanterns being manufactured at the same time with very similar dimensions and uses. It was probably economical also. The globes were available in a variety of colors. Clear and red are pictured below. Although I haven't seen them, blue and green globes are documented to have been manufactured by the Macbeth-Evans Glass Company in 1914. (See footnote) Some globes turn a wonderful shade of purple over time. 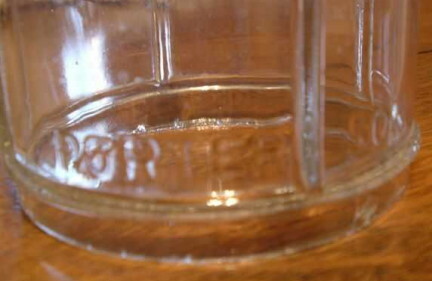 This condition is due to the fact that some of the glass used in that era had a high magnesium content. A chemical bonding process occurred between the magnesium content of the silica used in the glass and prolonged exposure to the suns ultra-violet rays causing the purple tint. Not all clear-glass globes produced during that era had the tendency to exhibit this phenomenon. Some globe manufacturers, Macbeth- Evans Glass Company for example, took extraordinary pains to use only the finest and purest of silica in their processing. An example of a purple tinted globe is shown below. Corning Glass Company also made Deck and Dark lantern globes. They marked their globes with the "PYREX" trademark. A red globe is shown below. Coming Soon.... Detailed measurement chart for Deck & Dark globes! Over the last several years, I've observed that many of the Deck and Dark lantern globes have different dimensions. Some of the globes do not fit in all of the Deck and Dark lanterns... making the globes... Not Interchangeable. Some globes must go specifically with certain manufacturers' lanterns. I am working on a detailed chart that will clarify the size differences and specify which globes fit into which lanterns. Please note that this has been a tedious process and is taking longer than expected, but I hope to complete it soon. Thanks for your patience. This unique globe has SIX ribs instead of the normal four. There are no markings on it. This rare globe has a "PORTER SON" marking and was recently noted. This unique globe is marked "F.H.L. & Co.". The F.H. Lovell & Co. was the predecessor to the Lovell Dressel Co. It is also a newly discovered marking. 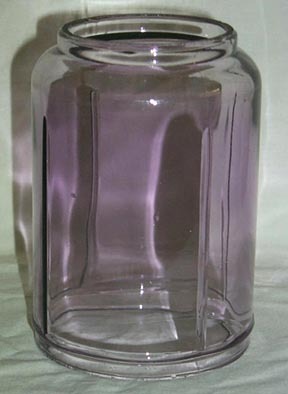 Here is a standard clear globe with purple tint due to the high magnesium content of the glass. New Globes listed - One of the NEW additions to the GLOBES page is a rare deck lantern globe marked "F.H.L. & Co.". The marking stands for the manufacturer F. H. Lovell & Co, who in the 1900’s made ship lighting & other lanterns. Later in the 1920's they became the Lovell-Dressell Company who is also well known for it's railroad lanterns. Another NEW addition is a "Porter Son" globe. Please see the Dark lantern pages for new photos of Porter dark lanterns not documented before. Both globes are rare because of the scarcity of the markings. 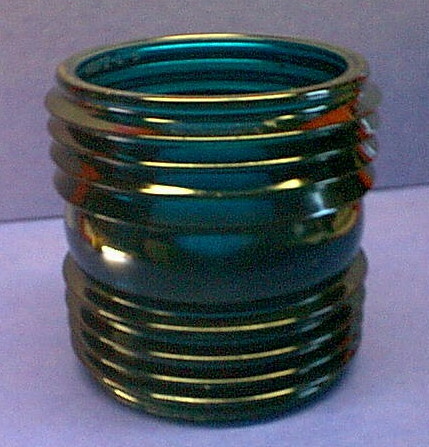 While marked for a specific lantern company, it is possible they were manufactured by a third party glass manufacturer. But this is only an assumption. MacBeth Evans Glass Co. Clear, Red, Green & Blue 5 1/4 marked "MacBeth No.218 Pearl Glass"
The green fresnal globe pictured below was made by G.B. Co. Although it was found in a Dietz Deck lantern, it was NOT originally used in these lanterns. The measurements for this globe were recently confirmed to not fit correctly in Deck and Dark lanterns. This globe has also been seen in other various nautical lanterns and will be dropped from this site in the future. **Footnote - Information on blue and green globes from - "The Illustrated Encyclopedia of Railroad Lighting Volume I - The Railroad Lantern", Richard C. Barrett, ©1994 & 1998, page 293.